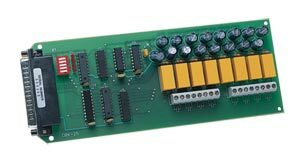 The OMB-DBK25 8-channel relay-output card provides OMEGA’s OMB-LOGBOOK and OMB-DAQBOARD-2000 Series data acquisition systems with eight fully independent relay contact outputs. Because the OMB-DBK25 is designed for use in portable as well as desktop applications, it employs miniature latch relays that draw power only when changing states, i.e., when changing from off to on or from on to off. This minimal power consumption makes the OMB-DBK25 ideal for applications that rely on battery power. The OMB-DBK25 relay contacts are rated for 2 A at 28 Vdc or 0.6 A at 120 Vac. As many as twenty-four OMB-DBK25’s can be used in one system, to obtain 192 outputs.